As you may have worked out, our office is based in Melbourne, Victoria, Australia. We do not currently have a base in New Zealand and all items are shipped directly from our warehouse in Melbourne. The total value of your cart exceed the low value import threshold (see our Terms & Conditions and customs.govt.nz for details) and you may be required to pay an additional amount equal to the GST and other import duties for these goods on arrival in New Zealand. By checking out you acknowledge that you understand and agree to meet this obligation. 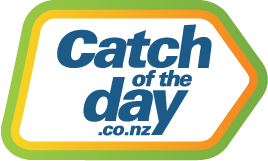 To find out costs incurred with customs, please note all currencies on catchoftheday.co.nz are in New Zealand dollars. Should you have any queries regarding customs tax or GST charges, please contact New Zealand Customs Service for further assistance. *If your order meets below the value, the message will not show in the cart.